Once during your turn (before you attack), you may remove all Special Conditions from your Active Pokemon. 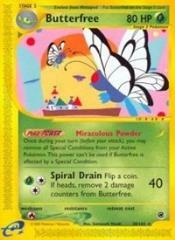 This power can't be used if Butterfree is affected by a Special Condition. Flip a coin. If heads, remove 2 damage counters from Butterfree.